Parte Occidentale dell' Europa,... [together with] Parte Orientale dell' Europa,... - CORONELLI, V.M. Date : Venice, 1690 - 1697. Size : 24.3 x 0.1 inches. / 61.6 x 0.2 cm. 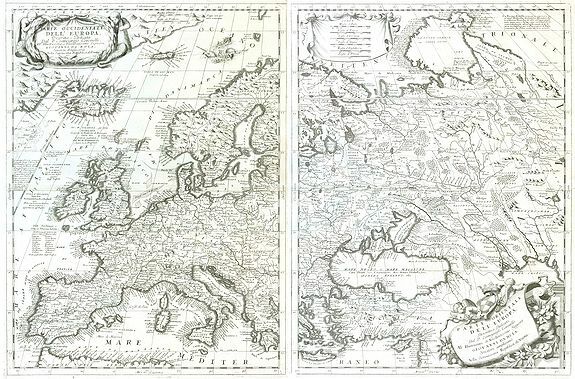 Description :Coronelli's double sheet map of Europe, from Atlante Veneto. Decorated with all manner of flora and fauna. Condition : Very good, strong impression, good paper quality. Small reinforcement in centerfold of right sheet.